Of course 'respect for the environment' is a very general topic with far-reaching and diverse areas. As sea swimmers most of these will be focused on the ocean, beaches and coastline. Unfortunately in Pembrokeshire, especially in the summer months, some beaches suffer from a litter problem, and worst of all, dog mess. It's easy to blame this on the tourists that come here but in reality locals are probably just as much to blame; either way some people are not very good at taking home their litter or clearing up after their dogs. 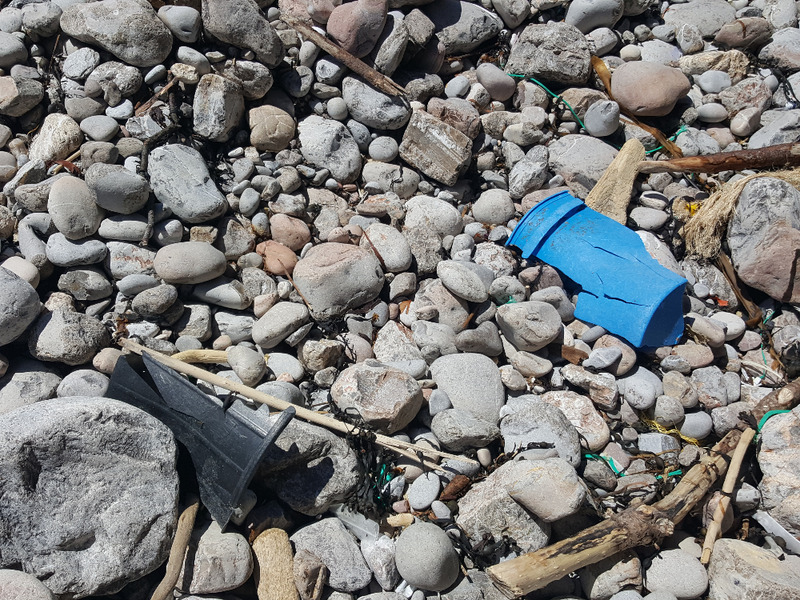 Typical detritus consists of plastic of all descriptions but unfortunately people do carelessly or deliberately leave their rubbish on the beaches and as a result you will sometimes come across drink bottles, cans, crisp wrappers, chocolate bar wrappers, and all that kind of litter. Also increasingly visible are disposable barbecues which are made of foil and just get left in the sand dunes or on the beach along with the grill, and are very hazardous and can easily cut your foot or hand. Then there's the dog mess of course. This is particularly irresponsible because everybody this day and age knows how disgusting it is and how much of a health hazard dog mess can be, causing nasty viral and bacterial infections. Yet, you may sometimes step in something you would rather not or find plastic bags full of dog mess lying on the beach or footpath, or even hanging in trees, in bushes or placed on walls. Very sad. Recently the government released a comment that if walking in a more remote area it is preferable to allow your dog to actually foul on the side of a path and then flick it into the bush or undergrowth; rather than pick it up, bag it and then leave the bag. This makes sense. Dog mess will rot down within a few days, but not if it is housed in a plastic bag and left there, even if it is biodegradable. And there's nothing worse for a walker or a child or anyone else to be confronted at face level by a bag full of dog mess hanging in a bush or tree! It's simply not acceptable. The other kind of rubbish that you might come across whilst sea swimming in Pembrokeshire are the kinds of trash that you cannot personally control, for example drift trash, such as nylon rope, fish nets, old bouys, discarded sandals, bits of foam and so on. Whilst it's a shame the stuff finds it's way onto the beaches, there's not a lot we can do about it. Indeed, this sort of rubbish may have travelled from the other side of the world. The only thing we can do is remove it when we see it. However, most of Pembrokeshire beaches are extremely clean. Over the winter months though the storms do dump quite a bit of detritus on the beaches which is then laboriously cleaned up by well meaning people during the spring and early summer. The easiest way you can help to keep our beautiful beaches clean is to take a small plastic bag with you and then just pick up any bits of plastic you see. We do this most times we go in and there's always enough to fill a plastic bag. It does not have to be a bin liner size, it can even be a spare poo bag. Something removed is better than nothing. If we did this each time we went to the beach, and if every person did it whenever they went to the beach, our beaches would be pristine. Thankfully some beaches do have bins on them but most do not, and this of course is the appeal of the beach, they are remote areas and in reality seeing bins lined along the top of a remote beach kind of kills the romantic image. In the end it has to be down to people acting responsibly and treating these environments with some respect. At the very least what you can do is to take your own rubbish home and this should be an expectation of all visitors. Simply dump your trash in your bag or a separate carrier bag, if there's a bin at the car park you can drop it off there or is there no bins then pop it in your car and take it home. And for people who bring their furry friend to the beach, make sure you pack some poo bags, scoop it up and bag it. If there are no bins to drop it off then please take it with you back to your home and do not leave it on the beach or in the car parks for other people to see and have to pick up. Most beaches will have a bin around the car park though. The main message we would like to give here is to just respect the environment, and other people. Respect that locals use these beaches every day either for pleasure or in many cases for work, and there are a lot of people visiting these beaches during the summer months which can easily escalate this problem so that it gets out of control. Worst of all, litter dropped on beaches ends up in the ocean. Ocean animals often mistake plastic bags as jellyfish and eat them. Over time they will eat many of these bags, that do not get digested but remain in their gut, eventually clogging up their intestines until they literally starve to death. Smaller plastic litter gets broken down into so-called 'micr-plastic', which gets eaten by fish and ends up in the food chain. The amount of plastic in the oceans today really is a terrible problem on a huge scale. So... every bit of help, really does... Help. The other thing that you can do is to join one of the many beach clean up sessions that are organised if you are around the area during the spring months. We have been on several of them and when you see 30 or 40 other people cleaning the beach picking up the litter, there's a real community spirit going on, and it gives a good sense of satisfaction when you finish. There's no pressure on these events to stay until the beach is spotless, just do what you can and spend as much time as you can. It's good to bring children to this kind of event too as it teaches them respect and pride in the environment, as they are the custodians of these places in the long term. 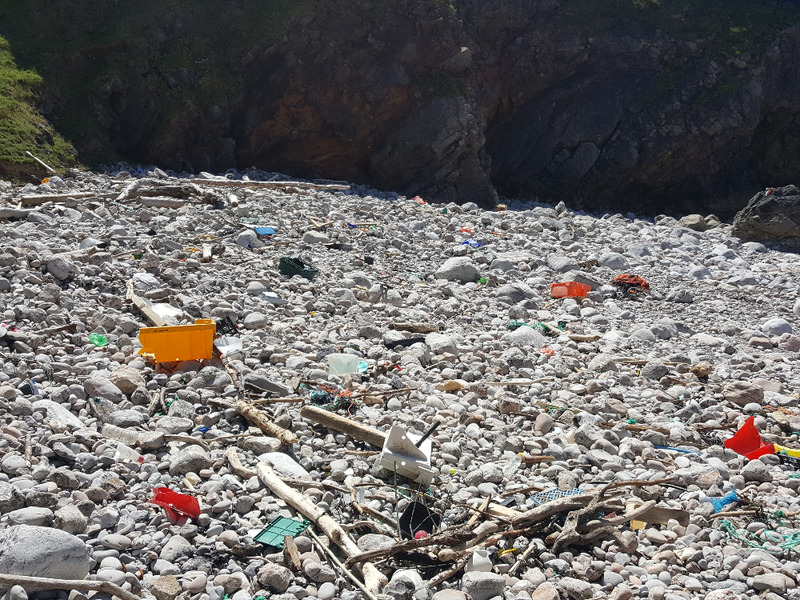 Luckily, having swam in seas all over the world, we can confidently say that Pembrokeshire beaches are extremely clean and we have not actually seen any rubbish floating in the sea while swimming here. It would be marvellous if I could say the same about the beaches. If you are interested in attending any of the beach clean up sessions please contact us here.